Bin-bin is located in Guangzhou Electronic City Liwan District, Guangzhou six hundred twenty-three Road 88, with a total construction area of ​​3000m2, brought together a large number of manufacturers, merchants, to Electronic City is located in Guangzhou Binbin Liwan District, Guangzhou six hundred twenty-three Road No. 88, the total building area of ​​approximately 3000m2, brought together a large number of manufacturers, merchants, business located in Liwan District, Wadi, south of the sand surface, building to the south east, Guangzhou Electronic City, north and north-south well-known commercial resort Shangxiajiu main road through Kang, Wang Ding popular , transportation connections, the city more than 20 bus routes. Guangzhou City Binbin electronic communications equipment, mobile phone accessories is the main shopping malls, equipped with air conditioning, elevators and other advanced modern business facilities. 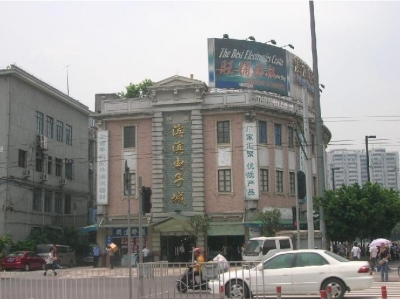 At Wadi commercial Liwan District, south of the sand surface, building to the south east, Guangzhou Electronic City, north and north-south well-known commercial resort Shangxiajiu main road through Kang, popular Ding Wang, convenient transportation, the city more than 20 bus routes. Guangzhou City Binbin electronic communications equipment, mobile phone accessories is the main shopping malls, equipped with air conditioning, elevators and other advanced modern business facilities.